It must be an August thing, because I’ve been dreaming about eggplant again. A thick purple gem of an aubergine came a few weeks back in my CSA, and I had been tossing around ideas of what I wanted to do with it for days. I knew I wanted it to be a dip perfect for pita — tomatoey, soft with a bit of a shimmer, not too smoky. I also knew I wanted to use the green pepper that came in the same box. But I couldn’t quite put my finger on exactly how I was to execute my vision. I knew that Aleza was coming to town, so I assured the eggplant that its fate would be a lovely one, if it could just hang on a few more days. In preparation for our visit, we chatted a bit online about my vision, bouncing around flavors from Israel, Persia and Armenia — places that do magical things with eggplant. On a Tuesday morning, Aleza and I hunkered down with slices of leftover blueberry pie in her parents’ kitchen. (Yes, I took a vacation day to cook this eggplant. And I think all mornings should start with slices of leftover blueberry pie.) While digging around the refrigerator, her dad came downstairs and asked us if we needed any help. “Oh no,” we assured him, “we’re all set.” We were just checking to make sure there wasn’t a vegetable we had overlooked who would want to join the eggplant. We ended up taking two smaller eggplants Aleza had picked up at the farmer’s market in Provincetown, to supplement my own. Although it had been literally a dozen years since Aleza and I cooked and studied together in Israel, it felt just so right to have planned an entire visit around cooking a meal. “It’s what we do,” Aleza summed up to her father. 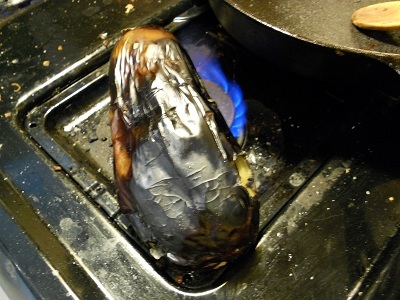 We began the eggplant preparation by placing them one at a time directly on top of a burner on the stove for about 10 minutes, turning them about every two minutes so that the entire eggplant would come into contact with the flame. This blistered its skin and started to soften its flesh. Then we tossed it into a very hot preheated oven and roasted it while we prepared the rest of the dish. 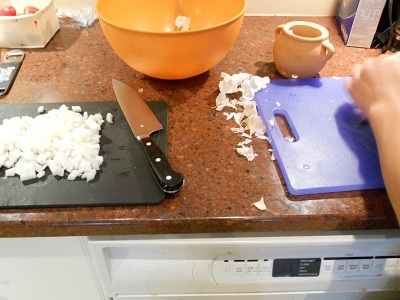 As we discussed relationships, politics, writing, religion, music and tattoos, I chopped the onion while Aleza chopped up the green pepper and garlic. We went with whole cumin seeds, which we added to a pan of hot oil, and watched until they jumped and popped. Then we added the onions and a pinch of salt, which we cooked for about 10 minutes, stirring with a wooden spoon every two minutes or so. Next we added the Aleppo pepper, green pepper and garlic, and cooked that altogether for about 15 more minutes. A good 40 minutes had passed since we’d added the eggplant to the oven, and Aleza could see it was ready by the way it had completely softened and collapsed in on itself. She knew it was really ready by the way the flesh was easily scraped from its skin with a fork, which she then added to the onion-cumin-pepper mixture on the stove. Then she added about half of a 28 oz. can of crushed tomatoes. She was a little worried that she’d added too much, but it was just what I’d had in mind. We cooked the dish for another 10 minutes or so, making sure all the flavors melded into each other. 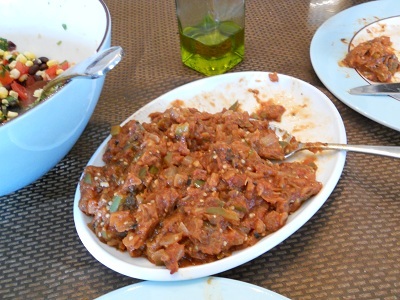 As we turned off the stove, Aleza drizzled a little red wine vinegar onto the eggplant, to perk it up. After toasting some pita (which I also purchased on my trip to the grocery store) we enjoyed my eggplant vision in its full glory, drizzling olive oil onto the servings on our plate.